Successfully Added 6 Action Camera Accessories Kit - Helmet Mount, Motorbike Roll Bar Mount, For GoPro + SJCAM to your Shopping Cart. The kit is compatible with GoPro Cameras as well as SJCAM SJ4000 and many other cameras as well. No matter what you want to film or where you may be, Dazzne have all the attachments and mount for your action camera. 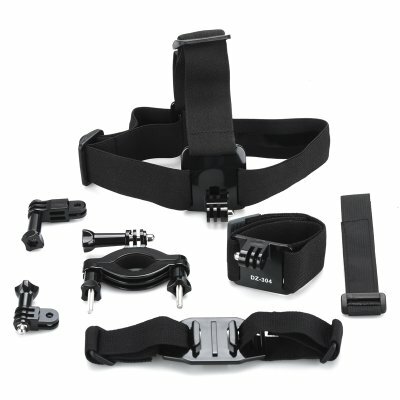 This kit comprises of a vented helmet mount, Velcro belt for your remote, a B style head strap. One way Go Pro wrist strap, safely steel wire and screws as well as a roll bar mount for your motorbike. These motorcycling camera accessories are designed for GoPro and SJCAM action cameras but will also fit many other sports cameras as well. They offer the best mounts to secure your camera when participating in sports and this particular kit is ideal if you’re planning on heading to the open roads and want to film you motorcycling adventures. Along with the Motorbike roll Bar Mount you get a vented helmet mount meaning your camera can be attached to a cycling, climbing or even Kayaking helmet to bring stunning action videos from a first person perspective and will let you capture adrenalin filled moments without the risk of losing your camera. You also get a Velcro strap that's got a easy to use and friendly rubber tab making it easy to use and adjust with gloved hands. This is ideal for skiing or even days out in the cold as you won’t have to freeze your fingers off adjusting the camera. For securing your camera there is a strong safety wire and screw that will let you keep it firmly attached to an secure point. This can stand up to the forces of nature and even in high winds, crashing waves or torrential downpours your expensive action camera will remain safely attached and anchored in place. This Dazzne Action Camera Accessories Kit comes with 12 months warranty. Brought to you by the leader in electronic devices as well as wholesale GoPro accessories, Chinavasion..